Entrepreneurs, marketers and writers can learn a lot from comedians. They write well, they understand culture, they blend artistry and commerce and most of them have had to single-handedly build their brands from the ground up. So I jumped at the chance to interview Kathy Griffin during her Celebrity Run-Ins, My A-Z Index press tour in New York City. 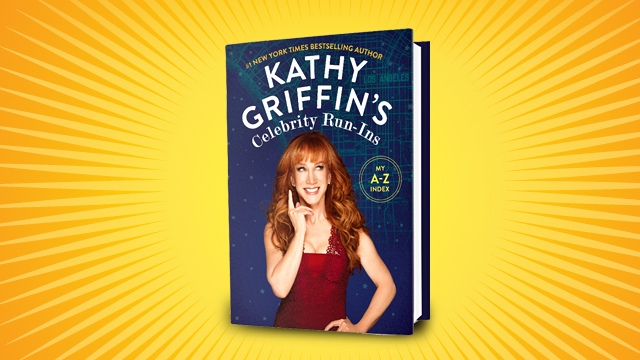 Not only is Griffin an Emmy- and Grammy-winning comedian and actress, she is also a Guinness World Record holder, the owner of three corporations, an online influencer with more than two million raving followers and a New York Times best-selling author. Her estimated net worth is around $15 million, so obviously she has figured out the business aspect of show business. Here are a few lessons that Griffin has learned by achieving success in a fiercely competitive industry. Early on, Griffin realized who and what she was -- and wasn’t. This gave her an edge, because while other women obsessed over becoming the typical Hollywood starlet, she focused on her own strengths. Just like marketing a business, if you’re marketing your personal brand, resist the urge to try and be a fit for every opportunity. Remember to find your ideal audience and play to your strengths. One could argue that Griffin's career trajectory began when she, a hopeful teen new to Los Angeles, snuck backstage at a Groundlings show. She singled out the best actor and got right to the point. Later, as Griffin realized her comedy wasn’t a great fit for clubs, she and a few fellow actresses decided to put on their own unique show. Today, Griffin is still a self-starter, working on projects without the power of a network behind her. For example, she and her assistant decided to make her book commercials on their own at her home. Comics and writers are known as noticers -- students of people and culture. But beyond that, Griffin studied the success of others. “Every time one of my pals would get successful, I’d at least try to get a takeaway and learn from it," Griffin says. This study led to the realization that she could probably achieve her own success faster if she started doing stand-up. She also literally studied, taking acting classes in the Groundlings program “very seriously.” Today, she’s still studying, gathering and writing. “I’m really, truly always writing in my head," Griffin says. "It’s a constant in your brain, 'What’s going to work today?' 'What’s going to work for a book vs. a TV show?'" 4. Build a support team. Not only does Griffin have a “small but mighty” team around her (her boyfriend, her assistant and her 93-year-old alcoholic mother), she also surrounds herself with advisors. She sought out the advice of Joan Rivers for years, and she frequently reaches out to Suze Orman for business and financial advice. As a celebrity, finding trusted team members can be tough. “I want people that are hungry,” Griffin says, explaining that she’s been burned by would-be stars and job-hoppers alike. Now, as advised by Orman, she has created “a defined benefit plan to incentivize the good ones to stay." 5. Remember, business (even show business) is business. Griffin carefully tracks which markets she’s toured in, how often and which jokes she’s told too recently. She researches each city, each show, even each interviewer -- including me, arriving with notes about her business model. “If you’re going to do a joke about the Kardashians, frankly, you have to really think because there are so many jokes out there," Griffin says. Lastly, aspiring entertainers need to realize it’s okay to ask a million questions, she says. The business part of show business may take a while to learn, but it’s paramount. Plus, all industries and markets are ever-changing today. That’s why you’ll see Griffin writing a book, then touring, then doing a TV special, then creating her own emoji app. This is a vital lesson she learned from Rivers. “Keep it all going, because you don’t know what’s going to hit," Griffin says. There was a gap of nearly a decade between Griffin’s acceptance into the union and her big break as a cast member on Suddenly Susan. “It just took for-e-ver,” she says. She admits that, of course, her big break did come and was followed by multiple awards, TV specials and her own reality show. Stick with it for the long haul and you’ll be glad you did. Griffin paid to work as a Groundling, and she kept taking on extra roles for years, learning the ropes and enjoying herself, before a fellow actor explained that she actually already qualified for the union. However there is a controversial side to Griffin's work. She’s been banned and un-banned from various shows, she’s had public Twitter battles, death threats, you name it. She has built a career on making fun of herself, as well as making fun of other entertainers. When you talk with Griffin about her journey, you get the sense that it’s been a constant uphill battle. What keeps her going? Love of the game.